Poor, poor Seamus. He's scared of his own shadow (heck, he's scared of every shadow), which is difficult for an O'Lantern because as an O'Lantern, Seamus is in the obligatory employ of the family business, Rent O'Lantern, which means he must sit on a festively (or frightfully) decorated porch on all Hallow's Eve. In the dark. All night long. Each year Seamus attempts to call in sick on the morning of Halloween. And each Halloween morn Seamus' mother, Siobhan O'Lantern, drags the lad by his stem from beneath his coverlet and rolls him out the front door to join his father and brothers as they ready themselves for the evening's work. Seamus' unsuccessful calls are a direct result of the fact that he still resides at home with his parents and hollering at the top of his seeds that he is feeling a bit under the weather never seems to fool his old orange-hued Mum. However, this year Seamus was feeling a little better about the whole idea of his employment at the family-run Rent O' Lantern, as his Da told him that he wouldn't be sitting on a porch at all this Halloween. In the dark. All night long. No, his Da explained to Seamus that he received a call from a wonderfully witty lass, LadyLinoleum, who wanted a Rent O'Lantern to sit happily on her coffee table during the Halloween celebration. Well, Seamus was ecstatic at the prospect of being inside. A well-lit home. All night long. For the first time in his rental lantern career, maybe he could be the happy Halloween pumpkin companion his family (and customers) hoped he'd be. Poor, poor Seamus O'Lantern. If he's not to be terrorized by sitting on a porch, in the dark, all night long this All Hallow's Eve, then his seeds are surely to be shaking in their orange skin at the prospect of having to spend his least favorite night of the year on a coffee table. Next to the horrifying Turkeyzilla. By the glow of the television set. All night long. Seamus is wonderful!! Poor little guy, being tormented by the dark and now having to endure a nigt with Turkeyzilla! Poor Seamus, That would be a disturbing sight at first. I want eyeballslike that maybe the optomatrist (sic?) would leave me along if I had them! How can he holler if he has no mouth. Gasp! Is he psychic! Will I have to fear psychic Seamus attacks once he's comfortable in his new home?!? :) I love him - he's great! He's cute, in a kinda creepy way. Poor guy, having to spend the night with Turkeyzilla! I had a ream last night or perhaps a "vision". 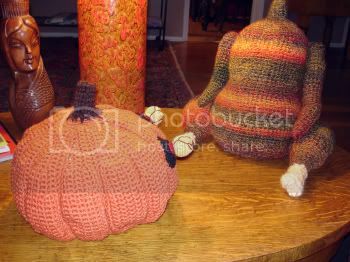 Regina girl, you must crochet an entire Thanksgiving dinner, down to the pumpkin pie! Yes, that was my dream and it was so cool! Seamus is awesome! He sure does look like he's terrified! Maybe the VLA can help keep him company and protect him. Seamus rocks. 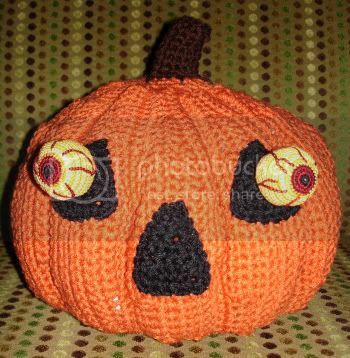 Scaredy punkin or not. Now his eyeballs could resemble marshmallows, right? So now you need the sweet potato. He'd be a veggie right? Sweet potatos are part of thanksgiving dinner, so you'd be on the way to fulfilling Deneens vision...lmbo!!! Seamus is faboo, of course! I would expect nothing less than faboo from Your Lady of Linoleum. What is that wonderful dotted fabric that Seamus is sitting on in his close-up shot? Looks like extremely hip upholstery. As you can see, I'm into backgrounds. Shoren', he musta bin wailin' like a banshee! omgosh reginam thats so awesome, poor seamus havuing to spend the night with turkeyzilla. i love deneen's idea of a whole thanksgiving meal, are you going to do it, crocheted food is awesome, and never has to be refridgerated looking good lady linoleum. keep it up, i love your different things you make. Oh me likes.....poor poor soul...bet his innards turned to puree....Turkeyzilla has that effect on a gourd I guess. I think poor little Seamus has seen way too much trauma in his young life! Love that Seamus! Anything Halloweeny gets my vote! I got the new Vogue knitting and thought of you. 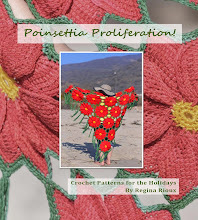 They have a pattern for an intarsia chicken pillow. It has seperate eggs you stitch and stuff and sew on. And it has fringe for grass. It also has a little wiggly eye. I can just see one of those with one of your eyeballs dangling from it! I think Seamus is faking his fear and has conned you, judging by the photo in which Turkeyzilla is looking distinctly terrorised and up against a metaphorical wall. Seamus' eyes seem to have some kind of hypnotic effect. Love Seamus!!! He can hang out in my kitchen INSIDE anytime!!! This post brought a tear to my eye. I'm not sure why. Could be your insane amount of talent, or maybe I identify with Seamus a little too much.